Defoliation followed by water deficit showed time-dependent effects on plant water status and growth in black spruce ( Picea mariana (Mill.) B.S.P.). Biotic stress negatively (during active defoliation by growing instars) and positively (after defoliation) affected plant water relations. However, water deficit, alone or combined with defoliation, prevails over defoliation-related stress for radial growth and sapling vitality. Tree vitality is influenced by multiple factors such as insect damage, water deficit, and the timing of these stresses. Under drought, positive feedback via the reduction of leaf area may improve the water status of defoliated trees. However, the effect on tree mortality remains largely unknown. 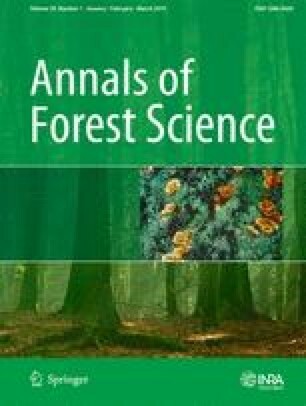 We investigated the effects of defoliation followed by a water deficit on tree growth, plant water status, and mortality in black spruce (Picea mariana (Mill.) B.S.P.) saplings. In a controlled greenhouse setting, saplings were submitted to combined treatments of defoliation and water stress. To assess the impact of these stresses and their interaction, we measured phenology, twig development, secondary growth of the stem, water potential, and mortality of the saplings. Both defoliation and water deficits reduced growth; however, the effect was not additive. During active defoliation, we observed a higher evaporative demand and a lower midday leaf water potential Ψmd. We observed an opposite pattern of response post-stress. Drought alone increased sapling mortality immediately after the stress period, but after c.a. 20 days, mortality rates remained similar following combined drought and defoliation. Our results highlight two key periods during which defoliation affects plant water relations either negatively (during active defoliation) or positively (after defoliation). Mortality in defoliated saplings was reduced immediately following drought because available internal water increased in the stem. Contribution of the co-authors All authors have contributed directly to the content of this work (study design, interpretation of the data, writing, and critical revision). H. Bouzidi, A. Deslauriers, and L. Balducci participated in the data analysis. J. Mackay and A. Deslauriers participated in the funding of the study. We thank S. Rivest for his help in collecting the data. This study was funded by the “Programme de soutien à la recherche, volet Soutien à des initiatives internationales de recherche et d’innovation (PSR-SIIRI),” the Ministère du Développement économique, Innovation et Exportation du Québec (MDEIE), and the Natural Sciences and Engineering Research Council of Canada (Discovery Grant of A. Deslauriers).